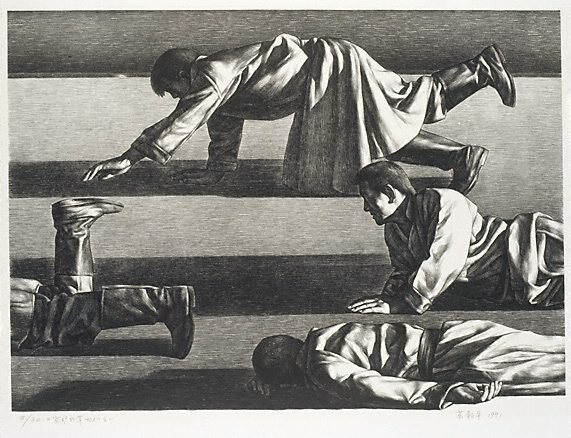 By the beginning of the 1990s Chinese artists were confidently experimenting with the various options available through the adaptation of Western styles to Chinese idioms, as can be seen in this lithograph by Su Xinping. Surrealism and photo-realism have been absorbed into the artist's repertoire, resulting in this disturbing and enigmatic evocation of an unspecified place in remote Inner-Mongolia. While the four figures are precisely drawn and modelled, their actions remain cryptic and the sharp spotlight from the viewer's right (traditionally the East) creates an ambiguous stage-like setting. Su Xinping's formal training in the arts began in 1979 at the painting department of the Tianjin Institute of Fine Arts. He worked as an art teacher in Inner Mongolia before resuming his studies and graduating from the printmaking department of the Central Academy of Fine Arts where he is now a lecturer. Art Gallery Handbook, 1999. pg. 265., By the beginning of the 1990s Chinese artists were confidently experimenting with the various options available through the adaptation of Western styles to Chinese idioms, as can be seen in this lithograph by Su Xinping. Surrealism and photo-realism have been absorbed into the artist's repertoire, resulting in this disturbing and enigmatic evocation of an unspecified place in remote Inner-Mongolia. While the four figures are precisely drawn and modelled, their actions remain cryptic and the sharp spotlight from the viewer's right (traditionally the East) creates an ambiguous stage-like setting. Su Xinping's formal training in the arts began in 1979 at the painting department of the Tianjin Institute of Fine Arts. He worked as an art teacher in Inner Mongolia before resuming his studies and graduating from the printmaking department of the Central Academy of Fine Arts where he is now a lecturer. Art Gallery Handbook, 1999. pg. 265. Signed and dated l.r., in Chinese, pencil "Su Xinping 1991".